I’m very lucky that I live in an area with a lot of really talented brewers and a great craft brew scene. You wouldn’t be hard pressed to find a couple of places where you can belly up to the bar and spend a few hours with some great beer. Considering how much I enjoy going to a brewpub with friends, I feel great ambiance is just as important as how good the beer is. 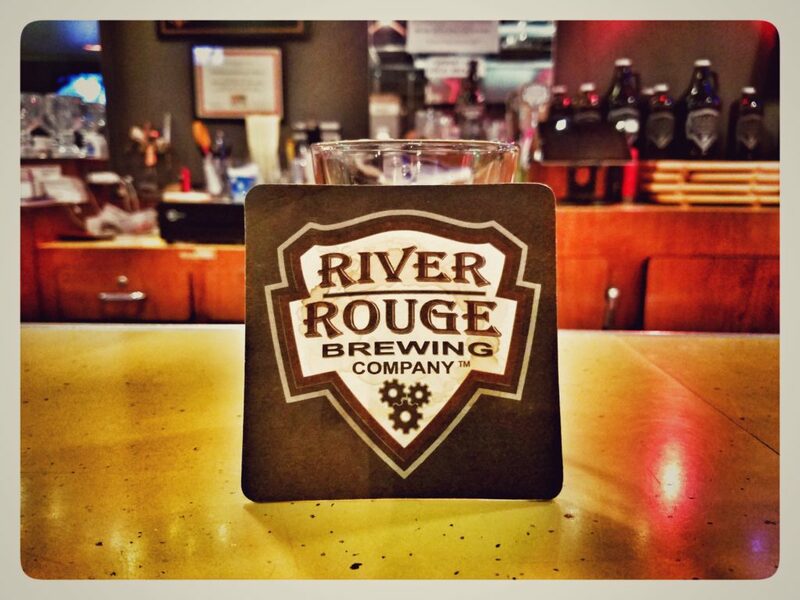 With that being said, this past Wednesday I was in Royal Oak, Michigan and decided to grab my friend Erik (he enjoys being grabbed) and visit River Rouge Brewing Company. A shot from directly inside the front door. When I first walked into the building, I was feeling nostalgic. It instantly felt like one of those old bars that you’d see in movies like “Tree’s Lounge” or “Barfly”. While the clientele was certainly younger than those in the movies – it had a feeling of familiarity. The bar area was an open space with a few black picnic tables and stools up at the bar. In full view, along the perimeter are the barrels, fermenters and other brewing equipment used to make the beer you’re drinking right then and there. The space has a great, cozy feel without feeling cramped. It’s not enclosed in glass or off in an unseen room somewhere. It gives you the feeling like you’re a part of the process that’s going into this beer. I saw a steady stream of customers – some were members of the mug club and some were right off the street like the two of us. The owner, Ed was working behind the bar. He was easy to strike up a conversation with, even joking with us that Erik had some catching up to do. With no snobby bartenders, and no judgement, Ed was there to answer any questions you might have on his beer or to talk about beer in general. Pecan Porter – Dark, with a sweet and buttery front end. Nitro Stencel Stout – I love nitro beers because they spread out the flavor and have a creamy texture that you just can’t get with regular carbonation. I didn’t try the regular Stencel Stout (also available), but on nitro it had a very pronounced chocolate taste. Martha’s Marzen – This was a typical Oktoberfest style – an enjoyable malty amber lager. 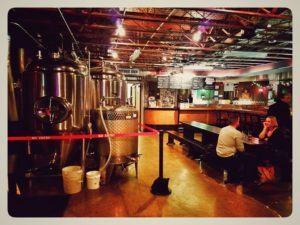 In my opinion, River Rouge Brewing Company embodies what it should be like when you go out to your corner bar, and you get the added benefit of it being a nano-brewery with great beer too!